In spite of getting good night sleep I drifted off during the Sacrament meeting. Then Sarah handed me a kids book that talked about Lehi's dream. you slow down not because you are out of fuel, but because your brain thinks you are about to run out of it. You speed up not because you got more fuel, but because your brain thinks it is coming. Elite runner stride has a well-time sequence of power surges and relaxations. The primary active agent of the fatigue-induced slowdown is the disruptions of those timings. I really liked his idea of visualizing that you are running on a non-motorized treadmill. Another Crocs day. Ran 2 mile warm-up in 17:37 with Hyrum. Then figured the Uneventful-Half would bring me to the target mileage for the run. Ran by feel, focused on running on a non-motorized treadmill. The pace naturally got faster. After a while I decided to see what would happen if I did not monitor it for a while. I hit the 2 mile mark in 12:41 when I decided to stop checking the pace. Next time I checked my split was at 5.05, and it was 31:24, 6:08 average for the unmonitored section. Then I checked it again at 7.5, and it was 47:01, 6:07 average for the unmonitored section. Then I monitored it from then on, and tried not to let the observation influence the pace. It was a fairly steady 6:07 - 6:15 pace that appropriately reacted to the changes in the terrain, which told me I was truly running by effort. Around 9.3 into the Uneventful Half I ran into Matt and he joined me. He has an interesting quality - whenever you run with him, you always feel like he is pushing the pace. Ran at around the same pace uphill to a little bit past Macey's with him (9:10 for 1.5), and then on the way back we were aided by the downhill, and both of us kind of cranked up the effort. I am not sure if I was responding to his moves, or if I was just making my own, but the pace eventually progressed into the sub-5:40 range. The last mile was 5:33. Total time for 13.11 was 1:20:13 (6:07.11 average). I toyed with the idea of cranking it up and catching the 1:20 guy, but I figured I would have had to run sub-5:20s, and I was not in the mood. Total time for 15.11 was 1:37:50. Too fast for an aerobic run, perhaps, but I figured since I'd be running slow tomorrow, and I do not schedule hard speed workouts any more, and my body naturally wanted to run this fast, I'd let it. P.M. 1 with Julia in 10:05, 1.5 with Jenny in 12:52, 2.55 in 19:46 including 2.11 with Benjamin in 16:47. All in Crocs. A.M. Crocs again. Started with Hyrum, Josse, and Jeff. Dropped Hyrum off at 2 miles. On his own initiative he ran his fastest post-comeback mile in 7:35 at the end. He'll be running with us all the way before too long. Then I needed to go to the bathroom. Jeff and Josse took off. I ran a brief warm-up 0.5 in 3:08, then cranked it up and hit a 0.5-1% downhill quarter in 1:19, eased off under the bridges and with turns on the next one to 1:25, then picked it back up to 1:20 on the following, and then caught Jeff and Josse about 50 meters later. Had a VPB around 8 miles into the run, caught up at around 5:30 pace, no splits. Dropped Jeff and Josse at 12.1, and ran 3 more by myself. Total time for 15.1 was 1:50:37. P.M. Wore Crocs. 2 with Benjamin pushing Jacob in the single stroller in 16:52, then 3 not pushing anybody with Benjamin riding a bike in 19:43. Was running easy until the last 1000, then picked up the pace. All I wanted to do was catch the 6:40 guy for 3 miles, but once I pressed the gas pedal I was immediately at a slightly sub-6:00 pace. So I ended up with a 3:41 for the last 1 K.
A.M. Ran with Jeff at 5:10 AM. Took a break from Crocs just in case, ran in racing flats. We started out with a 2:11 quarter (yes, that's right, 8:44 pace for 0.25, Kenyan warmup), 7:43 mile, then eased into a slightly sub-7:00 pace. After we crossed 9.6 mark I asked Jeff how he felt about catching the 1:10 guy, he said that would be fine. So we picked it up with around 0.45 to go, and ran the last two quarters in 1:28 and 1:22. I was surprised to see 1:22 on the last one as Jeff was telling me about the challenges of going to bed on time the entire time, and I was listening with more interest than I would normally have at 5:30 pace. Our time for 10.1 was 1:09:49, 6:54.75 average. P.M. Wore Crocs. 1 with Julia in 10:48, 1.5 with Jenny in 12:20, 5.6 by myself in 36:57, and 2 with Benjamin in 16:34. However, a mile later I started feeling better. We picked up the pace to sub-7:00. I ran to Jeff's house, dropped him off, then added the extra distance to make it 10.02. Thought of going a bit longer, but decided to err on the side of caution and finish the distance later tonight if I really felt better. Total time was 1:13:58. P.M. Stomach still feeling troubled. I set a dubious PR on this run for the number of different types of foul emissions from both ends of the digestive tract. Started with 0.5 in 3:44 to find Benjamin. Then 2 more with him in 16:14. Evaluated how I felt, and figured I should be able to handle another 4. Started with a 7:36 mile, feeling painful in the stomach, but nothing I cannot run through. Next mile in 7:05. Started feeling weak, like I wanted to walk home, or better, just lay down and not move at all. But the home is now 2 miles a way, so I'd better run, 2 miles of walking would be a long and painful walk with a sick stomach. Stopped for a VPB hoping it would make me feel better. Started running, still feeling weak, focused on a goal - keep it sub-8:00. After about half a mile I did not feel any better, but the pace got faster - started running 7:15 pace. Then about 3.35 into the run all of a sudden I started feeling extremely weak, I do not remember feeling that bad at the end of my worst marathon, and soon I found out why. A few seconds later I threw up, first time in 7 years. When I thought I was done, I started running, but was still feeling very weak, and for a good reason. I had more stuff to throw up. I stopped, finished the job, and all of a sudden felt almost normal. Finished the rest of the run at around 6:50 pace, 29:36 for 4 miles. I think this experience provides a good case for the brain-governed fatigue model. I did not have any less glycogen in my muscles in the moment of weakness right before throwing up when I probably would not have been able to sustain 8:30 pace than a couple minutes later when I was comfortably running 6:50s. So the most sensible explanation of what happened I can think of is that my brain sensed extreme stomach distress, and started shutting down the muscles in response to facilitate coping with it. When the distress was over, the muscles started receiving normal signal. A.M. Ran with Tyler. My original plan was to pace him through a 5 mile tempo at 5:30 pace. With the stomach troubles of yesterday that plan was put into question. However, I decided to give it a try anyway. I told Tyler I would run 5:30s until I can't. I did take some measures to ease the impact of GI distress. There were two concerns. One, if there is something in the stomach that is not being digested, the nausea will come up. Two, with the lack of ability to digest food, low blood sugar, and glycogen depletion would cause problems. I had an interesting experience with a 5 mile tempo after a stomach flu about a year ago when I was able to run 5:30s in the first 2 miles, but then very quickly digressed to 5:55s for the rest of the run. To mitigate the impact of the illness, I ate my standard breakfast meal right before bed (uncooked rolled oats, dates, and peanuts mixed with soy mile) along with some Powerade, and added a large cup of Powerade in the morning as well. We warmed up 2.62 miles and started the tempo. First mile was 5:24 with perfectly even splits by quarter. I noticed Tyler was struggling a bit at 5:25, and eased off the pace to the 5:30 target. Next mile was 5:31. Around 2 miles my legs started feeling slightly toxic, and I was concerned. But I figured I'd keep the pace for as long as I can and not worry about it. If I have to stop, I have to stop. Then we did a half in 2:45, (13:40 at the turnaround), and the next half in 2:46, which gave us another 5:31 mile. We got into a nice 1:22 per quarter groove after that, and I now started feeling confident I'd be able to sustain it to the end. Tyler struggled a bit around 3.75, so I eased off to a 1:24 quarter, which gave us a 5:30 mile for the next split. The mini-break helped Tyler regain his strength, and he pushed the pace to a 1:23 quarter on the mini-uphill, followed by a 1:21 once it flattened out. With about 500 to go he started struggling again, and a gap began to open up, but I figured he would close it in the final kick especially if he had a moving target, so I just kept the pace. Which is pretty much what happened. 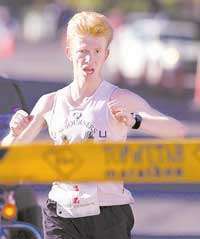 I finished in 27:21.6, Tyler was withing 0.5 of a second, which gave him a PR for 5 miles, as well as 4 miles en-route. Last mile was 5:25. Incidentally, this is my 5 mile PR for wearing Crocs, and only 33 seconds slower than my fastest time on that course. Then we did a long cool down at around 8:00 pace to make the total of 15 miles. I felt like I do at the end of a marathon on the last mile due to the lack of nutrition the day before, but otherwise everything was fine, much better than yesterday. I still could not eat very much at breakfast, but was able to get in enough to make me feel decent. P.M. 1 with Julia in 11:38, 0.15 to drop Julia off at the church and back, 1.5 with Jenny in 12:50, 2.53 with Benjamin to Jamba Juice in 21:55. Stomach still not good, dinner consisted of a small cup of Jamba Juice. A.M. We had quite a group this morning. Josse, Tyler, Steve Ashbaker, Cody, and Jeff. We paced Josse to a 1:34:51 Uneventful Half for a warm-up. This is her fastest time of the year on the slowest course she's run so far (if we adjust her Painter's time for the shortness of the course). Then Josse and Tyler were done, Jeff was going 16, Cody, Steve and I went for 20. We ran a tempo for the last 7 miles. I set a conservative goal of 6:00 pace given my stomach troubles lately and expecting a bonk. I felt somewhat hungry in the morning before the run. That was a good sign. I ate a honey sandwich and drank a large cup of Powerade. I also drank a large cup of Powerade after we finished the warm-up. Jeff was going to run 1.5 with us, then go back, Cody courageously decided to hang with us until death, then jog the rest of the distance. We ran the first mile of the tempo in 5:46, the pack was still intact. Jeff turned around at 1.5. We hit the next mile in 5:40 with some help from Steve's pace initiative. Then we noticed Cody was struggling, and eased off a bit to help him stay with us longer. He made it to about 2.75 mark. The next mile was 5:43. Steve moved upfront and pushed the pace, I just hung on for dear life. Next mile in 5:36 with a 180 in the middle. Steve was doing surges to 5:20 pace, then easing off. I started feeling a bit fuzzy in the head during the surges, and decided to just keep it steady and not respond. When I stopped responding to the surges, I felt a lot better, 1:23 quarters started feeling sustainable. 5:34 for the next mile in spite of a small net uphill. Steve's fervor died down a bit, he stopped surging. I enjoyed that, but not enough to move upfront and start pushing the pace. Our next mile was 5:37, and it was not a fast mile at all - net uphill, a couple of turns, sharp uphill curve coming from under the Geneva road bridge. On the last mile I finally felt like pushing the pace, so I moved upfront. We hit the next two nasty quarters (rolling net uphill, bridge tunnels) in 1:25 each. Then 1:24, and 1:21 on the last one with the help of a sprint in the last 60 meters, which gave us 5:35 for the last mile. Our total time for 7 miles was 39:31, 5:38.71 average. Total time for 20.11 was 2:14:22, 6:40.9 average. I suppose my body learned to burn fats better since I've been doing high mileage. I have no other explanation as to where I found the fuel to do two workouts like the one today and the one yesterday while struggling with a stomach flu and putting in the miles. P.M. Wore Crocs. 3 pushing Jacob in 22:24, then 2 with Benjamin (no Jacob) in 16:34. Still stomach flu issues, although better. Was able to eat my regular oats breakfast, and a large bowl of soy ice cream at night. Somehow managing to live off stored fat, I suppose.